Thomas Arnold was an English educator and historian. Arnold was an early supporter of the Broad Church Anglican movement. He was the headmaster of Rugby School from 1828 to 1841, where he introduced a number of reforms that were widely copied by other prestigious public schools. His reforms redefined standards of masculinity and achievement. 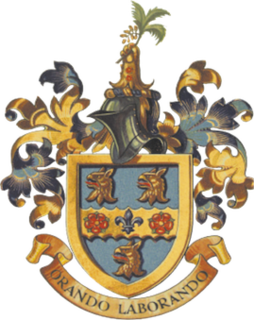 Rugby School is a day and mostly boarding co-educational independent school in Rugby, Warwickshire, England. Founded in 1567 as a free grammar school for local boys, it is one of the oldest independent schools in Britain. Up to 1667, the school remained in comparative obscurity. Its re-establishment by Thomas Arnold during his time as Headmaster, from 1828 to 1841, was seen as the forerunner of the Victorian public school. It is one of the original seven Great Nine Public Schools defined by the Clarendon Commission of 1864. Rugby School was also the birthplace of Rugby football. In 1845, three Rugby School pupils produced the first written rules of the "Rugby style of game". Laleham is a village beside the River Thames, immediately downriver from Staines-upon-Thames in the Spelthorne borough of Surrey. Until 1965 the village was in Middlesex. William Wordsworth was a major English Romantic poet who, with Samuel Taylor Coleridge, helped to launch the Romantic Age in English literature with their joint publication Lyrical Ballads (1798). Arthur Hugh Clough was an English poet, an educationalist, and the devoted assistant to Florence Nightingale. He was the brother of suffragist Anne Clough and father to Blanche Athena Clough who both became principals of Newnham College, Cambridge. The terms Old Boys and Old Girls are the usual expressions in use in the United Kingdom for former pupils of primary and secondary schools. While these are traditionally associated with independent schools, they are also used for some schools in the state sector. The term is also used for those who attended New Zealand schools, Sri Lankan schools, a few universities in the UK and, to a lesser extent, schools in Australia, Canada, South Africa and Spain. John Henry Newman, was a theologian and poet, first an Anglican priest and later a Catholic priest and cardinal, who was an important and controversial figure in the religious history of England in the 19th century. He was known nationally by the mid-1830s. Marquess of Lansdowne is a title in the Peerage of Great Britain created in 1784, and held by the head of the Petty-FitzMaurice family. The first Marquess served as Prime Minister of Great Britain. Wishing to marry, but unable to support a family on the wages of a private secretary, Arnold sought the position of, and was appointed, in April 1851, one of Her Majesty's Inspectors of Schools. Two months later, he married Frances Lucy, daughter of Sir William Wightman, Justice of the Queen's Bench. The Arnolds had six children: Thomas (1852–1868); Trevenen William (1853–1872); Richard Penrose (1855–1908), an inspector of factories;  Lucy Charlotte (1858–1934) who married Frederick W. Whitridge of New York, whom she had met during Arnold's American lecture tour; Eleanore Mary Caroline (1861–1936) married (1) Hon. Armine Wodehouse (MP) in 1889, (2) William Mansfield, 1st Viscount Sandhurst, in 1909; Basil Francis (1866–1868). Sir William Wightman (1784–1863) was a British judge. The Queen's Bench is the superior court in a number of jurisdictions within some of the Commonwealth realms. The original King's Bench, founded in 1215 in England, was one of the ancient courts of the land and is now a division of the High Court of Justice of England and Wales. Armine Wodehouse was a British civil servant and Liberal politician. In 1852, Arnold published his second volume of poems, Empedocles on Etna, and Other Poems. In 1853, he published Poems: A New Edition, a selection from the two earlier volumes famously excluding Empedocles on Etna, but adding new poems, Sohrab and Rustum and The Scholar Gipsy . In 1854, Poems: Second Series appeared; also a selection, it included the new poem, Balder Dead . Caricature from Punch , 1881: "Admit that Homer sometimes nods, That poets do write trash, Our Bard has written " Balder Dead ," And also Balder-dash"
"Matthew Arnold," wrote G. W. E. Russell in Portraits of the Seventies, is "a man of the world entirely free from worldliness and a man of letters without the faintest trace of pedantry". Arnold was a familiar figure at the Athenaeum Club, a frequent diner-out and guest at great country houses, charming, fond of fishing (but not of shooting),  and a lively conversationalist, with a self-consciously cultivated air combining foppishness and Olympian grandeur. He read constantly, widely, and deeply, and in the intervals of supporting himself and his family by the quiet drudgery of school inspecting, filled notebook after notebook with meditations of an almost monastic tone. In his writings, he often baffled and sometimes annoyed his contemporaries by the apparent contradiction between his urbane, even frivolous manner in controversy, and the "high seriousness" of his critical views and the melancholy, almost plaintive note of much of his poetry. "A voice poking fun in the wilderness" was T. H. Warren's description of him. Criticism began to take first place in Arnold's writing with his appointment in 1857 to the professorship of poetry at Oxford, which he held for two successive terms of five years. In 1861 his lectures On Translating Homer were published, to be followed in 1862 by Last Words on Translating Homer, both volumes admirable in style and full of striking judgments and suggestive remarks, but built on rather arbitrary assumptions and reaching no well-established conclusions. [ citation needed ] Especially characteristic, both of his defects and his qualities, are on the one hand, Arnold's unconvincing advocacy of English hexameters and his creation of a kind of literary absolute in the "grand style," and, on the other, his keen feeling of the need for a disinterested and intelligent criticism in England. Although Arnold's poetry received only mixed reviews and attention during his lifetime, his forays into literary criticism were more successful. Arnold is famous for introducing a methodology of literary criticism somewhere between the historicist approach common to many critics at the time and the personal essay; he often moved quickly and easily from literary subjects to political and social issues. His Essays in Criticism (1865, 1888), remains a significant influence on critics to this day, and his prefatory essay to that collection, "The Function of Criticism at the Present Time", is one of the most influential essays written on the role of the critic in identifying and elevating literature — even while admitting, "The critical power is of lower rank than the creative." Comparing himself to the French liberal essayist Ernest Renan, who sought to inculcate morality in France, Arnold saw his role as inculcating intelligence in England. In one of his most famous essays on the topic, "The Study of Poetry", Arnold wrote that, "Without poetry, our science will appear incomplete; and most of what now passes with us for religion and philosophy will be replaced by poetry". He considered the most important criteria used to judge the value of a poem were "high truth" and "high seriousness". By this standard, Chaucer's Canterbury Tales did not merit Arnold's approval. Further, Arnold thought the works that had been proven to possess both "high truth" and "high seriousness", such as those of Shakespeare and Milton, could be used as a basis of comparison to determine the merit of other works of poetry. He also sought for literary criticism to remain disinterested, and said that the appreciation should be of "the object as in itself it really is." ↑ Landow, George. Elegant Jeremiahs: The Sage from Carlyle to Mailer. Ithaca, New York: Cornell University Press, 1986. ↑ Composer Edward Elgar dedicated one of the Enigma Variations to Richard. ↑ Collini, 1988, p. 21. ↑ Super, CPW, II, p. 330. ↑ "Literary Gossip". The Week : a Canadian journal of politics, literature, science and arts. 1. 1: 13. 6 December 1883. ↑ "Book of Members, 1780–2010: Chapter A" (PDF). American Academy of Arts and Sciences. Retrieved 25 April 2011. ↑ "Obituary – Mrs. Matthew Arnold". The Times (36495). London. 1 July 1901. p. 11. ↑ Collini, 1988, p. 2. ↑ Lang, Volume 3, p. 347. ↑ Collini, 1988, p. 26. ↑ Bloom, 1987, pp. 1–2. ↑ Chambers, 1933, p. 159. ↑ Chambers, 1933, p. 165. ↑ Collini, 1988, p. vii. ↑ Collini, 1988, p. 25. ↑ Watson, 1962, pp. 150–160. Saintsbury, 1899, p. 78 passim. ↑ Collini, 1988. Also see the introduction to Culture and Anarchy and other writings, Collini, 1993. ↑ See "The Critical Reception of Arnold's Religious Writings" in Mazzeno, 1999. ↑ Arnold, Matthew (1913). William S. Johnson, ed. Selections from the Prose Work of Matthew Arnold. Houghton Mifflin. ↑ Watson, 1962, p. 147. ↑ Machann, C (1998). Matthew Arnold: A Literary Life. Springer. pp. 45–61. ↑ The New Dictionary of Cultural Literacy, Third Edition. Sweetness and light. Houghton Mifflin Company. ↑ Born, Daniel (1995). The Birth of Liberal Guilt in the English Novel: Charles Dickens to H.G. Wells. UNC Press Books. p. 165. 1 2 3 Caufield, James Walter (2016). Overcoming Matthew Arnold: Ethics in Culture and Criticism. Routledge. pp. 3–7. ↑ Malachuk, D. (2005). Perfection, the State, and Victorian Liberalism. Springer. pp. 87–88. 1 2 Brendan A. Rapple (2017). Matthew Arnold and English Education: The Poet's Pioneering Advocacy in Middle Class Instruction. McFarland. pp. 98–99. ↑ Brendan A. Rapple (2017). Matthew Arnold and English Education: The Poet's Pioneering Advocacy in Middle Class Instruction. McFarland. p. 116. ↑ Machann, C (1998). Matthew Arnold: A Literary Life. Springer. p. 19. ↑ Bush, Douglas (1971). Matthew Arnold: A Survey of His Poetry and Prose. Springer. p. 15. ↑ Jones, Richard (2002). "Arnold "at Full Stretch"". Virginia Quarterly Review. 78 (2). ↑ Jacoby, Russell (2005). Picture Imperfect: Utopian Thought for an Anti-Utopian Age. Columbia University Press. p. 67. ↑ Alexander, Edward (2014). Matthew Arnold and John Stuart Mill. Routledge. I have tried to show to what a considerable extent each shared the convictions of the other; how much of a liberal Arnold was and how much of a humanist Mill was. ↑ Rodden, John (1999). Lionel Trilling and the Critics. University of Nebraska Press. pp. 215–222. ↑ Campbell, Kate (2018). Matthew Arnold. Oxford University Press. p. 93. ↑ Kahan, Alan S. (2012). "Arnold, Nietzsche and the Aristocratic Vision". History of Political Thought. 33 (1): 125–143. ↑ Gurstein, Rochelle (2016). The Repeal of Reticence: America's Cultural and Legal Struggles Over Free Speech, Obscenity, Sexual Liberation, and Modern Art. Farrar, Straus and Giroux. pp. 57–58. 1 2 Super, CPW, VII, p. 384. ↑ Super, CPW, VI, p. 171. ↑ Super, CPW, VI, p. 176. ↑ Super, CPW, VI, p. 143. 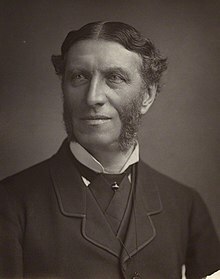 Wikimedia Commons has media related to Matthew Arnold . "MATTHEW ARNOLD (Obituary Notice, Tuesday, April 17, 1888)". Eminent Persons: Biographies reprinted from The Times. IV (1887-1890). London: Macmillan and Co., Limited. 1893. pp. 87–96. Retrieved 12 March 2019– via Internet Archive. This article incorporates text from a publication now in the public domain : Cousin, John William (1910). A Short Biographical Dictionary of English Literature . London: J. M. Dent & Sons – via Wikisource. Plaque #38 on Open Plaques . John Clare was an English poet, the son of a farm labourer, who became known for his celebrations of the English countryside and sorrows at its disruption. His poetry underwent major re-evaluation in the late 20th century: he is now often seen as one of the important 19th-century poets. His biographer Jonathan Bate states that Clare was "the greatest labouring-class poet that England has ever produced. No one has ever written more powerfully of nature, of a rural childhood, and of the alienated and unstable self." Sir Geoffrey William Hill, FRSL was an English poet, professor emeritus of English literature and religion, and former co-director of the Editorial Institute, at Boston University. Hill has been considered to be among the most distinguished poets of his generation and was called the "greatest living poet in the English language." From 2010 to 2015 he held the position of Professor of Poetry in the University of Oxford. Following his receiving the Truman Capote Award for Literary Criticism in 2009 for his Collected Critical Writings, and the publication of Broken Hierarchies , Hill is recognised as one of the principal contributors to poetry and criticism in the twentieth and twenty-first centuries. Lives of the Most Eminent English Poets (1779–81), alternatively known by the shorter title Lives of the Poets, is a work by Samuel Johnson comprising short biographies and critical appraisals of 52 poets, most of whom lived during the eighteenth century. These were arranged, approximately, by date of death. Sir Christopher Bruce Ricks is a British literary critic and scholar. He is the William M. and Sara B. Warren Professor of the Humanities at Boston University (US) and Co-Director of the Editorial Institute at Boston University, and was Professor of Poetry at the University of Oxford (UK) from 2004 to 2009. He is the immediate past-president of the Association of Literary Scholars and Critics. He is known as a champion of Victorian poetry; an enthusiast of Bob Dylan, whose lyrics he has analysed at book length; a trenchant reviewer of writers he considers pretentious ; and a warm reviewer of those he thinks humane or humorous. Hugh Kenner praised his "intent eloquence", and Geoffrey Hill his "unrivalled critical intelligence". W. H. Auden described Ricks as "exactly the kind of critic every poet dreams of finding". John Carey calls him the "greatest living critic". Sir Herbert John Clifford Grierson was a Scottish literary scholar, editor, and literary critic. Heathcote William Garrod was a British classical scholar and literary scholar. Sweetness and light is an English idiom that can be used in common speech, either as statement of personal happy consciousness, or as literal report on another person. Depending upon sense-of-humour, some may use the phrase with mild irony. For example: The two had been fighting for a month, but around others it was all sweetness and light.. P. G Wodehouse, esteemed humorous writer employed the phrase often, sometimes with a slight nod to the phrase's dual-edge. Originally, however, "sweetness and light" had a special use in literary and cultural criticism meaning "pleasing and instructive", which in classical theory was considered to be the aim and justification of poetry. 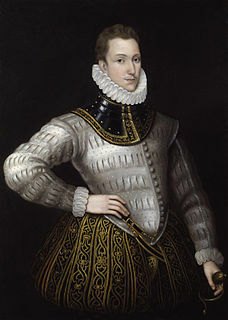 An Apology for Poetry is a work of literary criticism by Elizabethan poet Philip Sidney. It was written in approximately 1580 and first published in 1595, after his death. Michael O'Neill was an English poet and academic, specialising in the Romantic period and post-war poetry. Stefan Collini is an English literary critic and academic who is Professor of English Literature and Intellectual History at the University of Cambridge and an Emeritus Fellow of Clare Hall. He has contributed essays to such publications as The Times Literary Supplement, The Nation and the London Review of Books. He completed his undergraduate degree at Jesus College, Cambridge and his doctoral studies at Yale University. Edward Killoran Brown, who wrote as E.K. Brown, was a Canadian professor and literary critic. He "influenced Canadian literature primarily through his award-winning book On Canadian Poetry (1943)," which "established the standards of excellence and many of the subsequent directions of Canadian criticism." Northrop Frye called him "the first critic to bring Canadian literature into its proper context". John Strachan is a literary critic, historian and poet, Professor of English and Pro Vice-Chancellor at Bath Spa University, England. He was educated at the University of Southampton and Oxford University. Strachan specialises in Romanticism and is author of Poetry, which was released in 2000 by Edinburgh University Press. He has published numerous articles in the fields of history, sport studies and poetry. In 2013 he collaborated with numerous artists and poets to create Their Colours and their Forms: Artists' Responses to Wordsworth, which included some of his own poetry. He lives in Bath, Somerset. As an author, he is widely held in libraries worldwide.